Here's a familiar image: you wake up early in the morning, read the morning news, drink coffee, and fly away to work. I call this image "familiar" in the sense that popular culture is teeming with images of people climbing into rockets, autogyros, helicopters, and other types of aircraft only to shuttle off to complete the day's errands. From The Jetsons to Blade Runner, personal air vehicles have been an almost necessary complement to popular visions of the future. It continues to this day. I.D. Magazine recently gave the Icon A5 Sport Aircraft a "Design Distinction" award for its 2009 Annual Design Review. According to the company website, founder Kirk Hawkins wanted to create a new type of aircraft "designed to deliver an amazing and safe flying experience, but also to inspire us the way great sports cars do." The result, the tiny, sleek, compact ICON A5 "is a bold yet elegant design that communicates beauty, performance, safety, and most importantly… fun." 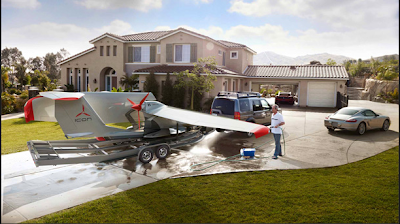 A quick glance at the various renderings on the website communicate this point: we see family taking a plane to the beach, and in one image, a man hoses of his A5 in his own driveway. Although these images depict the A5 as a recreational vehicle (something like a ATV or personal watercraft), it would not be difficult to make a conceptual leap and see Icon's aircraft as a commuter vehicle. Such a leap is no doubt helped by the fact that the Icon A5 is almost, literally, a car with wings. The various altimeters and airspeed indicators in the A5's cockpit echo those from an automobile dashboard ... and a contemporary one at that, for the GPS display in the A5's instrument panel is not unlike one you would find in many entry-level sedans. Icon's aircraft is also quite small, earning the FAA's new "light sport aircraft" designation. The A5 also has headlights, giving a more car-like appearance. There is nothing about the A5 that looks outright futuristic. In fact, the airplane comes in a familiar pusher-seaplane configuration with retractable lading gear. 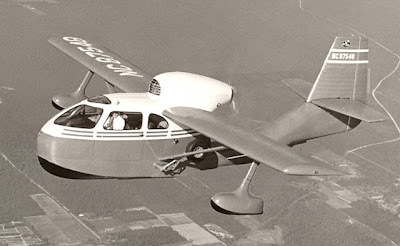 The A5's high-wing loading and cockpit-engine arrangements echo the Republic RC-3 Seabee Amphibian, a postwar entry into the realm of "personal aircraft." Aside from the obvious formal differences, cabin size, and engine capacity, there is still very little difference between these aircraft. 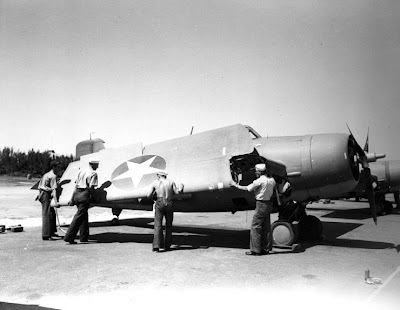 A website dedicated to the Seabee asserts that Republic built the Seabee according to "conventional manufacturing methods." The A5, on the other hand, is built from advanced "lightweight and non-corrosive carbon fiber." The original product brochure even stated that "Republic engineers are evolving a plane for all-around personal, family or business use that has long been wanted by sportsmen for hunting and fishing use and by all types of private fliers who like the additional safety and flexibility of both land and water operation." This statement echoes many of the testimonials on Icon's website. In this age of hub-and-spoke airline networks, frequent flier programs, code-sharing, Southwest, JetBlue, Virgin America, Ryanair, et cetera, we usually think of the airplane-as-conveyance. Yet Icon's website -- via renderings, images, videos and testimonials -- points to the airplane-as-accessory. It would not take much to see A5 featured in one of Monocle's lavish techno-luxury spreads. And for a suggested price of $139,000, the A5 is definitely an accessory for the wealthier set. Icon's Hawkins explains on the company website how new FAA regulations inaugurated the idea of the airplane-as-accessory. Yet one could even say that Icon's goal is to show how the "light sport aircraft" is an accessory for modern living. And though this post began with an invocation of popular images of personal aircraft, the Icon A5 belongs to an important modernist trope: the airplane as an accessory of modern living. 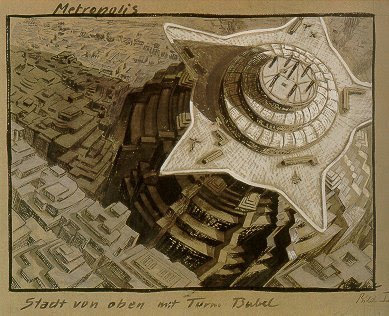 More familiar, or course, are Otto Hunte's, Erich Kettelhut's, and Karl Vollbrecht's set designs for Fritz Lang's Metropolis (1927). The epitome of their well-known designs is the massive skyscraper with petal-like cantilevers -- the building the serves as the headquarters for Johann Fredersen, the film's villainous industrialist. In Metropolis, this babel-tower-like building dominates a canyon made of smaller skyscrapers. At the bottom, cars and bodies clog the streets. Higher up, the colors lighten: bridges connect buildings lightly, delicately. Small propeller monoplanes circle the brilliantly-lit sky above. The differences in shadow and light between the top of Fredersen's skyscraper and the glass canyon below are vital. This contrast emphasizes a key theme for Metropolis: the division of dark and light, congestion and freedom, ground and air become metaphors for the city's stark division of labor. 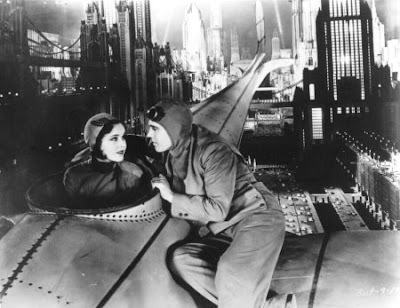 The airplane therefore becomes the proper means for conveyance in Metropolis. 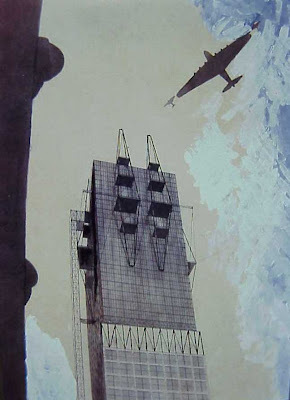 In fact, one of Kettelhut's early designs for the set shows a giant airport sitting atop Fredersen's skyscraper. 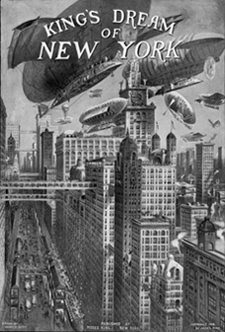 The airplane became a familiar staple in some notable projects by architects in the early 20th century. More often than not, the presence of the airplane was something like a guarantee of foresightedness, sophistication, or even of technological savvy. Before writing Aircraft (1935), his paean to flying machines, Le Corbusier gave a series of lectures in Buenos Aires about the state of architecture and urban planning in the Americas. 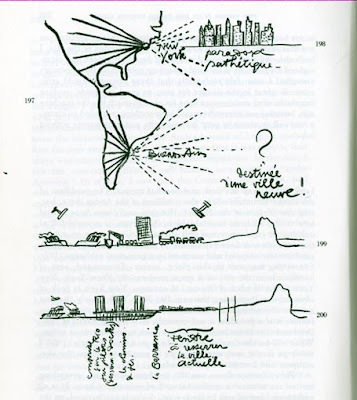 Collected in a single volume called Précisions sur un État Présent de l'Architecture er de l'Urbanisme (1930), several of the lectures feature Le Corbusier's famous exhortation about the aerial view. His drawings showing how a Plan Voisin-like series of cruciform towers could be transplanted to South America feature aircraft. Here, again, the airplane is an indicator of modernity. Other architects looked to the polemical implications of an airplane. Ivan Leonidov's rendering of his Commissariat for Heavy Industry (1934) is the exact opposite of a bird's-eye view. The vantage point (more like a worm's eye view) here is slightly above grade -- it is as if the viewer is craning his neck at an unnatural angle to see Leonidov's steel and glass fantasy reach into the sky. 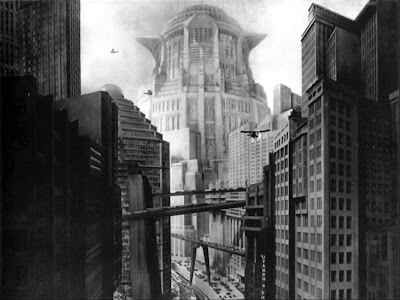 The various antennae jutting out of the sky read as a much more sparse ornamentation than that on Kettelhut's design for Metropolis. They suggest airplane parts -- the various struts and guy wires that bind a biplane's wing to the fuselage. 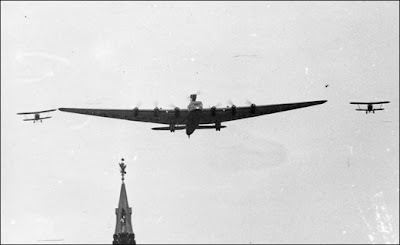 Yet the focus of attention is in the sky -- a single Tupolev ANT-20 aircraft (with two smaller Polikarpov I-15 fighters attached to its wingtips) lumbers in the air above. The ANT-20 is an unusual aircraft. 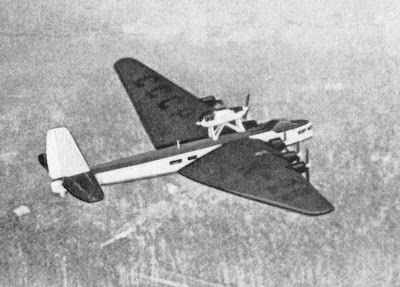 Designed as a flying propaganda machine, the airplane (nicknamed the "Maxim Gorkiy") featured a printing press, radio station, movie screening room, and photographic developing equipment. It is the perfect complement to Leonidov's building. Although there are many other examples, it is worth noting that personal aircraft were an important part of these modernist visions. 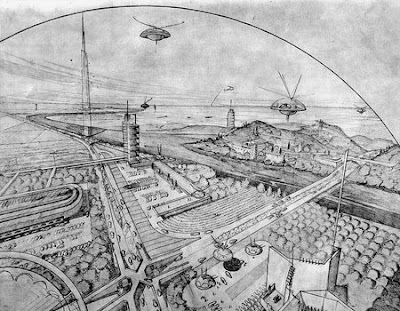 For example, Frank Lloyd Wright's drawings for his Broadacre City project (1932-1958) always feature small, helicopter-like devices hovering over the landscape. Such a vision suggests how personal aircraft are an important means of conveyance for a low-density urbanism like Broadacre City. 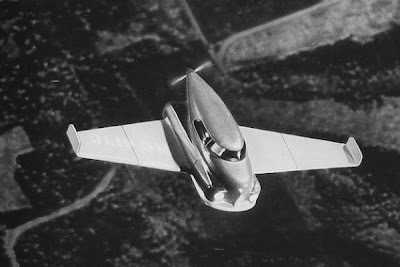 But the project that most closely resembles the Icon A5 is Norman Bel Geddes' 1945 concept for a flying car. This hybrid vehicle is quite literally a car with wings. The most familiar image shows the car flying over a low-density Broadacre-like landscape. But another image of the concept model reveals more about the nature of Bel Geddes' project. Here, the flying car is parked on a quiet residential street -- its folded wings suggest a carrier fighter plane transplanted to the suburbs for everyday use. The flying car has been a familiar concept ... for a long time. And in the 1930s, converting cars for aerial use could have made a certain amount of sense. 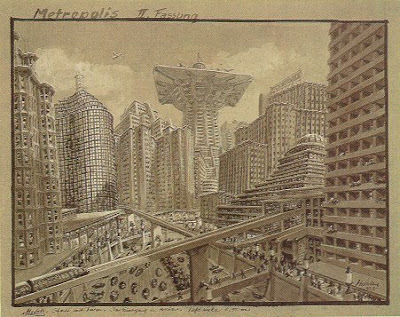 If the automobile became an important aspect of American and European urbanisms, then it follows that the flying car would perform a similar function in the future city. And as the Icon A5 demonstrates, this idea is still very much alive. 1 Dietrich Neumann, Film Architecture: Set Designs from "Metropolis" to "Blade Runner" (New York: Prestel, 1996), p. 112. The idea of hosing a plane in your garage sounds exciting and terrifying at the same time. Walter Gropious said the same thing about the Dessau Bauhaus building: that it would be understood best from the sky. For those who couldn't afford that, there were always photographs. There is something liberating in the idea that everyone can rise into the air. Someone argued in a reading I read that the Eiffel Tower was transformative in that way in 1889. In any case your blog is very interesting! I hope you're having a great summer! I've just discovered your blog and am really enjoying it, particularly that your essays have depth and are lengthier. I am surprised you haven't mentioned Terrafugia's Transition, which unlike the Icon A5 is literally a flying car: http://www.terrafugia.com/photogallery.html. Anyway, great blog. Hi François ... thanks for the kind comment. The only reason why I focused on the Icon A5 as opposed to the Terrafugia is that Icon included more images of the aircraft in domestic and urban settings. I was interested in the way the airplane was portrayed. 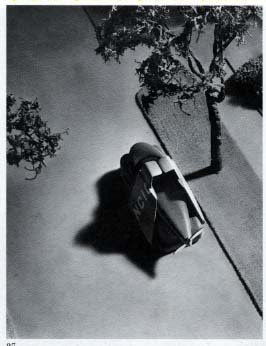 But thank you for reminding me about the Terrafugia, which would be more in line with Bel Geddes' vision.